Red Deer Jeep Packrats • View topic - Bighorn protection proposal. Post subject: Bighorn protection proposal. Shannon Phillips and the Y2Y are at it again. Last time it was the castle area, now the bighorn west of Caroline and Rocky are under the knife. This will end most back country use, it will certainly be the end of any jeeping or quads in the back country. Time to get involved and put an end to this "initiative". If your on the fence or think this might not be that bad, take a look at what they just past in the castle region. Post subject: Re: Bighorn protection proposal. Time to sell i guess. Not just the Castle. Wheeling in the porkies and the livingstone is almost gone as well. 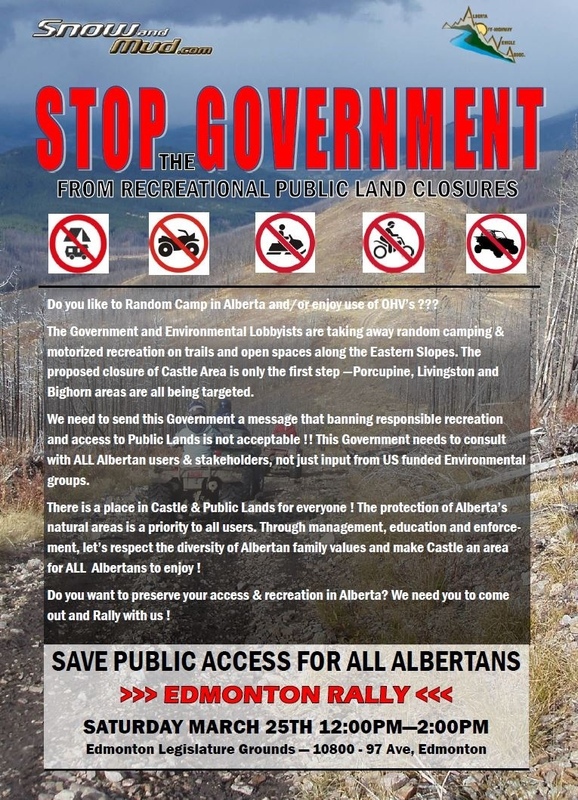 The ndp are very active in completly shutting down all random camping and motorized recreation in all the foothills of Alberta. There is a rally on the legasative grounds in Edmonton in a couple weeks. That's the day before I get home from Oz otherwise I would be there. Hopefully they give the ndp hell. From what I've read the bighorn proposal extends east of the forest reserve so potentially everything west of hwy 22 could be a no go.